HR Manager – What would you like them to speak on? Director – Oh, I don’t know. Something motivational…. HR Manager – So someone who has climbed a mountain or overcome incredible odds? Director – Oh – no – we want them to be relevant to our real workers, they have to achieved things – but nothing too unrealistic…. 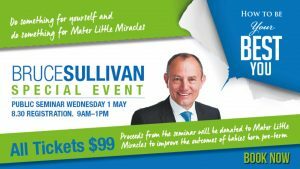 HR Manager – So a motivational speaker? Director – No – not one of those god awful preacher types who will make me wave my arms about…. Ever been in this situation? Wondering how you will ever find a key note speaker that is all of those things? Do you need someone that can appeal to your factory floor workers but not insult your professional staff? Need someone who can entertain and enthuse your jaded, conference weary managers but not be over the heads of everyone else? Well stop looking! Bruce Sullivan is the man you are looking for. Bruce will research your organization, its culture, its “in house” terminology and present a session that will have them clutching their sides with laughter, groaning in recognition and most importantly taking away some pointers they can actually put into practice (both at work and at home)!! Bruce spoke at our 2004 National Conference. The audience were staff and partners and had all age groups and all levels of education. Bruce captured all of the points we wanted to get across and taught people some very important life lessons without them even realizing the impact. We did unnatural acts, we learnt not to “should all over ourselves” and learnt about the facts of life! You can’t beat that for an afternoons entertainment!! I highly recommend Bruce as a key note speaker or as MC for your whole event. It will be money well spent.